I like this episode it is very funny and sad in parts and shows Albert and Harold in a very new light. 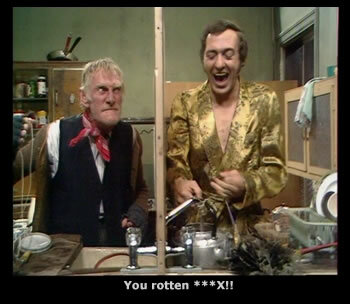 Whenever I am talking to somebody about Steptoe and Son it is only a matter of seconds before they say “What about the one where they split the house it two”, or something similar. While people may claim that other episodes are “the best”, in my experience this is undoubtedly the best remembered episode. The irony is, that the bit where they do split the house, accounts for under half the episode, however Ray and Alan maximise the moment with one funny moment after the other. It seems we are laughing continually. Is it any wonder we all remember this episode with affection. What shouldn’t be forgotten is that the other parts of the episode where the house is in its original state, is classic Steptoe. All of the features of the comedy are here, Harold’s self-aggrandisement, some classic “dirty old man” behaviour and a good old rummage amongst the junk. The episode starts with Harold deciding the time has come to decorate the home. As usual all of his ideas are rejected by Albert. Harold selects a wallpaper from the brochure that has been used in Blenheim Palace, Albert pours scorn on this, his suggestion is to “Bung all the bits up” from the wallpaper brochure. As they tidy up several items resurface that have not been seen for many years, including Albert’s best false teeth. The action that follows has the audience howling with laughter as Harold attempts to keep down his breakfast. This leads Harold to come to the inevitable conclusion that the only forward is “Apartheid, separate development”, and so the reconstruction of the house begins. 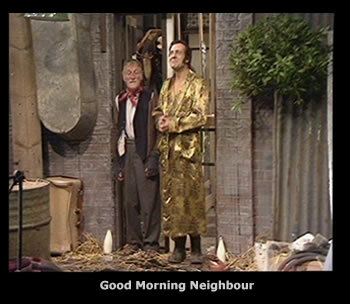 The result is that Albert is still living in exactly the same conditions, while Harold’s half of the house attempts to give an upmarket appearance, but he is forced to a number of compromises. The table and television need to be shared and so the partition runs right down the middle of the two. 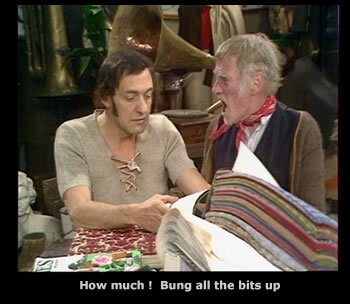 As previously stated a number of comical incidents occur including what I think is my favourite line from the complete Steptoe series. Harold wants to watch the ballet on TV, Albert wants a horror movie. Even though it is Harold’s turn to choose what programme to watch, Albert keeps changing the channel. As they discuss the situation via a hatch in the partition, Harold explains that he has the law of contract on his side, to which the old man replies “I’ve got the knobs on my side”. As usual with the Steptoe’s it isn’t long before things start to go wrong and in this case with dangerous implications. Disaster brings the Steptoe’s back together. 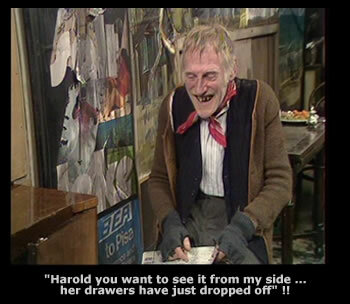 This was the first "Steptoe and Son" episode that I ever saw and it makes me howl with laughter as much now as it did then. The plot concerning the splitting up of the house was an inspired idea by Galton and Simpson. The scene that remains in my memory, is when Harold and Albert argue over the T.V. A classic moment. Also included, are some of the programme's funniest lines. to give a typical example: "you smell worse than a pair of zookeeper's boots." 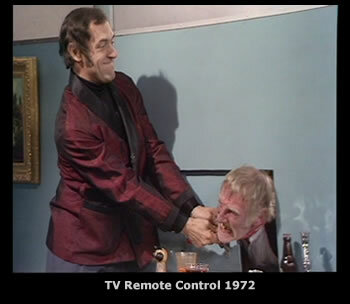 Harry H. Corbett and Wilfrid Brambell display with incredible ease how and why they were impeccably well cast as the two leading characters; they were fortunate enough to have a full range of mannerisms, facial expressions plus other remarkable qualities to bring this script and every other one to life. This is a great episode in the Steptoe cannon and probably this and The Desperate Hours are the pinnacles of British comedy. Harold complains ``I have the law of contract on my side `` and quick as a flash with perfect comic timing Albert replies `` But I have the knobs on my side``. This is British comedy at its best and this was directed by David Croft as regular producer John Howard Davies was ill. This was the 6th Episode of Series 7.